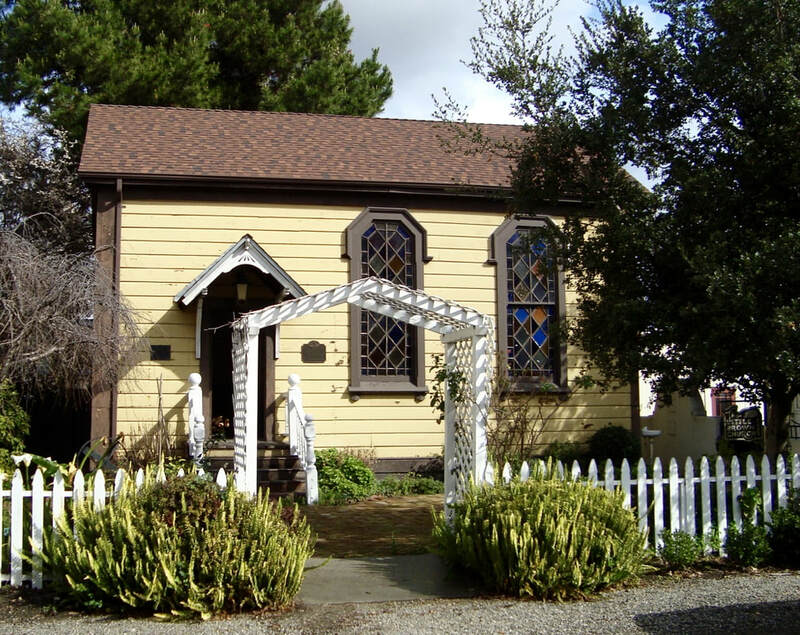 The First Presbyterian Church—the third church to be built in San Leandro—was dedicated on April 28, 1867. Construction was not entirely completed when services were held there for J. W. Josselyn, a deputy county clerk who was killed in the 1868 earthquake that caused the collapse of the Alameda County Courthouse two blocks down Clarke Street. Nothing remains of first two churches in San Leandro— the Methodist church (1856) and the old St. Leander’s (1864). The First Presbyterian Church stood on the northwest corner of Clarke and Hepburn (today’s West Joaquin). Church members raised the $5,000 for its construction. Captain Andrew Halverson brought lumber for the church aboard his schooner from San Francisco. 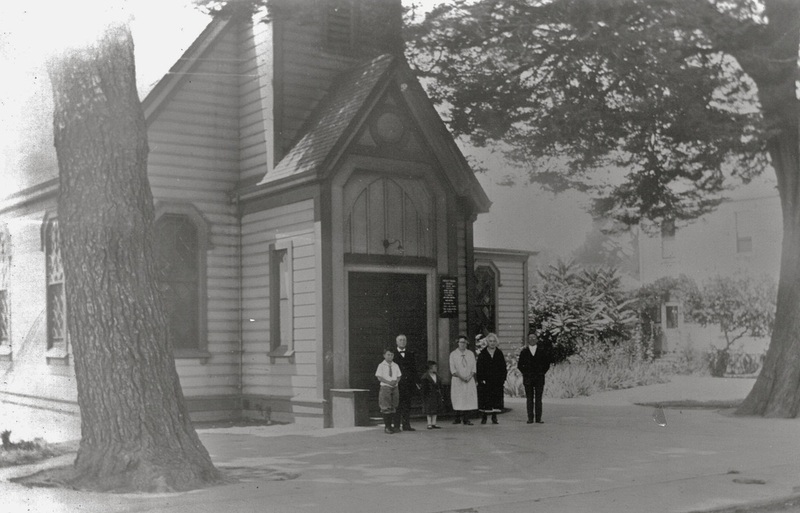 The church was built with old-growth redwood, no doubt one of the reasons the sturdy old building still graces San Leandro more than a century and many earthquakes later. Members of the First Presbyterian Church always referred to it as the Little Brown Church (possibly because it was unpainted redwood). Around 1890, a 21x31 foot room was added to the church for a Sunday school. On April 4, 1888, the Ladies Society was organized at the home of Mrs. Thrasher with 21 ladies present. 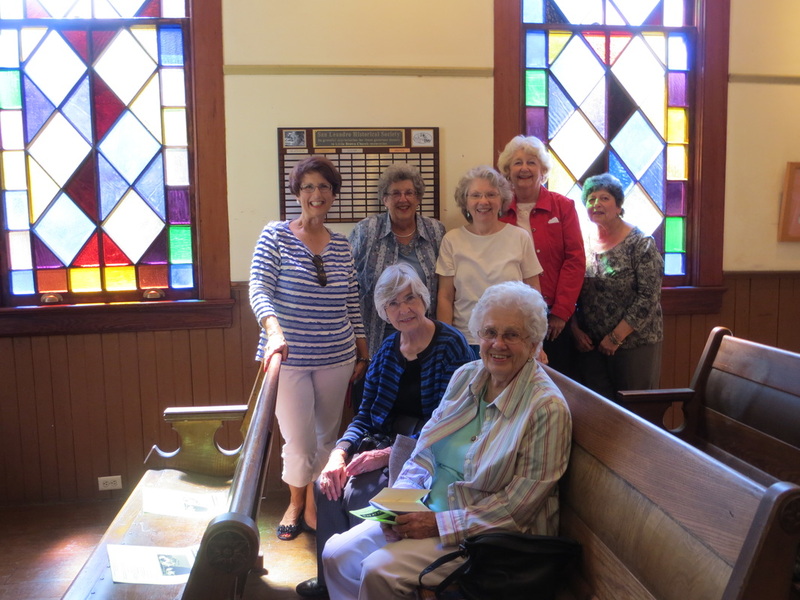 These dedicated and organized women raised money by fines, dinners, and fairs, and soon the church was repaired and re-carpeted, there were new chandeliers, books, window shades, and enough left over to keep up the church grounds. They put on bazaars, booths, and sewing bees to help the needy, and they were dedicated as well to fighting the “demon rum”. In 1925, the congregation moved to a new building on Estudillo. Ten years later, the sanctuary part of the old church was moved to an area near Fairmont Hospital, where it was again used for religious services. In the early 1960s, it was demolished to make way for a freeway. The Sunday school wing remained on Clarke Street. Ethel Saunders, a missionary assigned to San Leandro, taught a daily Bible class, and reading, writing, sewing, and cooking, in the old Little Brown Church Sunday school wing. Inevitably, the lot was sold and the building slated for demolition. But the San Leandro Historical Society acquired the building and moved it down the street behind the old Daniel Best home. Three years later, in 1979, the Best home was about to be sold, and once again the Little Brown Church needed a new home. The city council and the city’s historical cultural advisory commission agreed to permit the church to be moved behind the Casa Peralta, only a block away. It took half a day and cost more than $3,000 to move the church the second time. Trees had to be trimmed and a 7-by-15 foot of the Casa Peralta wall opened to allow the building to reach its new home. In ceremonies more like a church social than a formal event, the memories flowed like wine among 75 people who disregarded early morning breezes to tour the tiny chapel… One of the celebrants was Margaret Valentine Rose, whose arrival in town in the early 1920s coincided with her membership in the church. Miriam Phillips of Castro Valley examined window hinges installed by her father, the church’s pastor from 1910-27. Leslie Valentine of Folsom, Mrs. Rose’s brother, recalled that as an 8-year-old he wore a kilt in the 1925 parade from the church – then on Clarke Street – to the new Presbyterian church building, still standing at 180 Estudillo Ave.
Phyllis Miller said the parade was led by her father, Ed Duck, a Sunday school superintendent and city mayor, who later that decade joined Alameda County District Attorney Earl Warren in raiding the “Bucket of Blood” saloon in downtown San Leandro. These are old stories, but there are new stories being added, as weddings, baptisms, and historical society events are held in the historic Little Brown Church. In 2013, thanks to generous grants from the Questers, State of California, and the Questers, Estudillo Chapter of San Leandro, as well as private donors, the Historical Society was able to restore the colored glass windows to shining glory, finding old-growth redwood frames and fir mullions under many layers of peeling paint. Below, the Questers posed in front of the newly-restored windows. More than 120 years old, the Little Brown Church needs restoration and care. Our next goal is removing lead-based, peeling paint and restoring the exterior of the building.